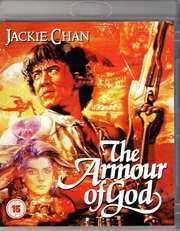 Starring as the Asian Hawk, a bounty hunter and martial arts expert with an insatiable taste for adventure, Jackie is blackmailed by a mysterious cult leader into acquiring "The Armour Of God", a mystical artifact from the Dark Ages, which holds the key to unlimited power. Combining action, romance and Chan`s trademark Keaton-esque comedy, "Armour Of God" is an explosive heart-pounding martial-arts extravaganza, which is internationally one of Jackie`s highest grossing films to date. Featuring a dazzling array or precision driving stunts, high-falls and explosive, high-energy fight action, this is one movie that is guaranteed to thrill from beginning to end.